Help the Evermore guard defend a village from Reachmen raiders. Soldiers from Evermore were defeated at Murcien's Hamlet by a Reachman attack. Talk to Squire Theo Rocque. Search the houses for Medya Zurric. "Where are the rest of the reinforcements? Are you all they sent?" "Sharp as a nail! Definitely no raw recruit. Reachmen swarmed into Murcien's Hamlet. We were overrun, but I thought our leader had sent for reinforcements. Apparently not." "We could use it. Report to Squire Theo Rocque on the docks. We're taking orders from him for now." I'll look for Squire Theo. The third way to start the quest is head to the docks with Murcien's Hamlet and speak with Squire Theo himself. The survivors of settlement and the soldier's counterattack can be found behind barricades on the docks. Squire Theo Rocque will be among them and you can introduce yourself to him and see what he wants. At this, the local healer Medya Zurric will approach with news of Sir Etienne. You can listen to them to learn about the situation. Once they have finished speaking you can find out what Squire Theo needs done. You also have the opportunity to ask about what happened before you arrived and his personal history with the Reachmen. While he goes to check on Sir Etienne, your job is to inspect the eastern and western fortifications in front of the docks and deal with any problems they may have. The barricades can be checked in either order. As you approach the fortification on the east side, you will find that it is on fire. Luckily for you, the settlement's well is just north of your position and probably has a bucket that can be used. Fight your way through any nearby Dark Witnesses to the well and grab the full Water Bucket. Return to the burning barricade and put out the fires by interacting with them. Soon after you near the fortification on the west side, Dark Witnesses will start attacking. The guard posted there, Davyd Admand will assist in fighting off the three[verification needed — two?] waves of Reachmen. Once they are dealt with, the western fortification will be deemed secure for now. After you have inspected both fortifications, you may hear Squire Theo shout out. Head to place where he said was going to— Medya Zurric's home. The house is on the northern side of the village, atop a small hill. Once you enter, you will find Squire Theo crouched next to a dead man in Breton armor —Sir Etienne Hu. Speak with the shaken squire to see what he knows. After agreeing to look for clues, search the nearby area near Sir Etienne's body. There are four possible clues to find. On the table there will three place settings where a meal was seemingly interrupted. Lastly, there will be an open book lying next to the bookcase. Reading it will reveal it to be the Hamlet's records for the years 2E 541—2E 542. The text will mention that Medya was a survivor of Black Drake's invasion of Bangkorai and that she had a son the year after. Once you have found the clues, you can speak with Theo who will act as sounding board for the evidence you have found. Though you can go through the evidence in any order, this walkthrough will go through them in the order they appear. First is the murder scene itself. He was stabbed right through his breastplate with his own sword which suggests his assailant was very strong and that his guard was down. The latter is corroborated by the fact he was eating a meal with at least two other people before he was attacked. There were two other people with him, based on the dishes. He trusted the people he was with. The second point is the evidence Sir Etienne was receiving treatment and the bloody washbowl. The killer cleaned themselves after killing Sir Etienne but didn't go out of their way to hide evidence they were there. The third point of evidence is village records, though Squire Theo will not see how they are important. Once you have gone over the three pieces of evidence, you can sum up your conclusion to Squire Theo. I think there's only one thing we can be certain of here. After concluding that Medya is likely a witness to the crime, it is imperative that you find her. Your initial lead is Rolbert Foucher, her apprentice in healing. He can be found down at the docks, treating the wounded. Rolbert will be annoyed at being interrupted. There are two different questions you can ask him, both will need to asked before he provides you with another lead. Firstly, you can ask him about Medya herself. He has only nice things to say about her but he didn't know she had a son. He also mentions reiterates the fact that she was around the last time the Reachmen came down in mass from the hills. Secondly, you can ask him about the history of the village. Interestingly, he notes that the Reachmen avoided raiding Murcien's Hamlet after the Black Drake's invasion. Once you have asked the above questions, you can ask Rolbert if he knows where Medya could be. I need to find Medya, do you know where she might be? Search the houses for clues to Medya's whereabouts. As you may have noticed while walking through Murcien's Hamlet, most of the buildings have been burnt down. Only three are still standing, while Medya hasn't been seen in her own home, the other two houses are a good place as any to start looking. While both houses are called the Abandoned House, they are located on different sides of the village and both contain leads to finding Medya. Inside the abandoned bouse on the east side of the village, you can find a letter on the table. Likewise, in the abandoned house on the west side, a similar note can be found. Though they are by different authors, the letters make the same points. 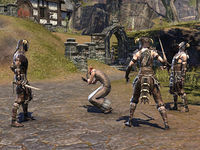 Medya told the house's residents that they would be spared during the impending Dark Witnesses raid due to their "old family roots" — Reachmen ancestry. Secondly, both letters mention that she visited a particular spot at night. To get to the bottom of this, you will need to find this site, both letters provide a clue for this location. The letter from the western abandoned house says she goes to the shoreline to the east, while letter from the eastern house mentions that the spot is behind their house. Following the above clues, head to the shoreline behind the eastern abandoned house—dealing with Dark Witnesses along the way— and keep an eye out for anything that stands out. It won't be long until you come across a Reachmen shrine with familiar looking vines and skulls. At this point, it is evident that Medya follows the Reachmen ways and her involvement in Sir Etienne's death is likely. Especially after Sir Theo made the point of saying that the soldiers wouldn't pull out of Murcien's Hamlet until both he and Sir Etienne were dead. With this in mind, you should find Squire Theo and tell him what you discovered as well as to protect him as it is clear that he is in danger. As you approach Medya Zurric's home, it will appear that you are too late as Theo calls out a warning to you. After this, you can run into the house to find Labhraidh standing over a prone Squire Theo. Medya will be standing off to the side, dressed in Reachmen clothing and paints. It will be necessary to fight Labhraidh as he refuses to stand down, he will fight with dual axes and use Berserker abilities. Once the Labhraidh is dead, Squire Theo will come to and approach a distraught Medya with a drawn weapon. When you speak with Squire Theo, he will ask you to help him make a choice. At this point you now have a choice, you can either have Squire Theo spare her so she can go on trial in Evermore, or let him kill her then and there. You will then receive your reward. I need to locate Squire Theo at the docks to learn how I can help the village. I have arrived at Murcien's Hamlet to find Squire Theo Rocque in charge. He's asked me to wait a moment while he speaks with one of the village elders. Squire Theo Rocque is speaking to a village elder by the name of Medya Zurric. I should let them finish speaking. Squire Theo Rocque is done speaking with Medya Zurric and I should speak with him. I should inspect the fortifications at Murcien's Hamlet to make sure they are reasonably intact while Theo checks on Sir Etienne Hu. I should visit the fortifications on the west side. Reachmen are attacking the fortifications on the west side. I should keep them from breaking through the defenses. I should visit the fortifications on the east side. I should look nearby the fortifications for some water to put the fire out with. I should put the fire out at the fortifications now that I have a bucket of water. Squire Theo called for my help. He mentioned that he would be at Medya Zurric's home checking on Sir Etienne Hu. I should look for him there. 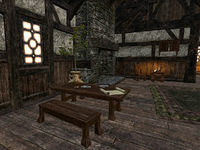 Squire Theo Rocque asked me to search Medya Zurric's home to see what has happened to Sir Etienne. I should look around for clues. Sir Etienne has been murdered. I should investigate Medya Zurric's home for clues. Now that I've searched Medya Zurric's home, I should speak with Squire Theo Rocque. Medya's no longer in her home. I should speak to Medya's apprentice, Rolbert Foucher. He's on the docks with the others. I need to search the Hamlet for Medya as she may be in danger, just as Sir Etienne was. I should search inside the homes for her or for any clues which might help me find her. A letter inside one of the homes indicated that Medya goes to a specific site at night, but that nobody knows what she does there. I should look for her there. I should return to Squire Theo Rocque at Medya Zurric's house. I've been gone long enough, and he may be in danger himself. Medya Zurric's son Labhraidh has come to her defense. I must defeat him before she can be brought to justice for allowing Sir Etienne Hu to die. When confronted about her Reachman son, Medya Zurric refused to treat Sir Etienne Hu, allowing him to die. Now her fate must be decided. Finishes quest Medya Zurric will stand trial in Evermore for her actions. I should speak to Squire Theo to find out what will happen next to Murcien's Hamlet. This page was last modified on 29 December 2018, at 09:05.